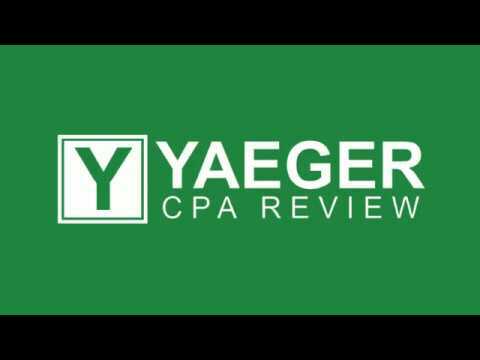 Yaeger CPA Review is a comprehensive and flexible CPA review course. Founded over 40 years ago in 1977 by Phil Yaeger, it has remained a family-owned business that serves students through a live instructor hotline. This study program provides DVD, USB, Online and mobile based course formats which offer a lot of flexibility to students as to how and when they want to study. Basically, Yaeger walks his students through multiple-choice questions and gives tricks as well as other tactics they should use when taking the exam. Yaeger practice tests and lecture videos come fully loaded with unlimited use. As a matter of fact, there are no other restrictions which many other review courses normally have. Additionally, students are not limited to the number of computers they can download their materials on. The most impressive part of this program is that its total cost is below the industry average. In order to ensure that their prep material is as up-to-date and relevant as possible to the current year’s CPA exam, Yaeger bases their entire CPA prep course around the Blueprints published by the AICPA. This means that their study program is designed in lock step with the goals of the organization that grades the CPA exam, ensuring high success rates for enrolled students! There is a built-in Flashcard simulator on Yaeger CPA course website. It contains very comprehensive flashcards for each section. You can get through the full course and then use these flashcards in your final review. The student portal is designed with a quiz engine which is pretty awesome. With the Yaeger Quiz Engine, students can easily create custom quizzes from any topic. Everything is simply done in-house and the quizzes and built into their website. You can set the number of questions and time limit. There are several topics to choose from such as FAR, AUD, REG, and BEC. In fact, you can include as few or as many topics as you may wish. You can also save the quiz and take it again later. There is no limit at all. Yaeger quiz engine custom quiz feature is extremely useful because it allows you to focus only on important areas that are needed to pass the exam without necessarily including topics that you already know. Certainly, this system will save you a significant amount of time and greatly help you learn and retain information at a faster rate. The lectures are easy to follow as they contain step by step instructions. At first, the lectures mainly focus on why you’re doing what you are doing to get the correct answer. They then teach you what you’re supposed to do and how to go about it in a very logical manner. Yeager’s instructors usually work hundreds of multiple choice questions with the aim of helping you to navigate through the tricky problems, giving you the repetition needed to pass your CPA exam. The questions are very comprehensive and explanations extremely useful in helping you learn why you got some questions right or wrong. As previously mentioned, Yaeger’s use of AICPA Blueprints as inspiration for their curriculum makes their prep program highly accurate to the test itself, with regular updates every year to reflect any changes to the test. Their Live Instructor Hotline offers immediate personal supports better than any other review course. You can directly contact the instructors by phone or email for any help you may need almost anytime. Yaeger CPA Course materials are available in 4 different formats including USB, DVD, Online, and Mobile Device. There are absolutely no limitations pertaining to the number of computers you can download them to. Besides that, there is no set restrictions access on the videos or course materials. There is an open and supportive forum where you can easily post questions and problems. This forum plays an essential role of keeping you in touch with other students and see what other people are doing to pass their exam. Use a Yaeger coupon code to save on a great course. By taking advantage of a Yaeger CPA discount, you’ll have some money left over for your exam fees! If you’re a student with a shorter attention span, this might not be the best fit program for you because it is very possible to get bored with the traditional video lectures. The lectures are structured very much similar to most college accounting classes and are a bit slower than an independent self-study type of learner would prefer. The average lesson length is usually about 30 to 60 minutes long. It can be difficult for people who want to split their studying up into smaller chunks of time. Even though there is a new study at your pace’ option available for students, the regular course still has a time limit of 18 months. If you think you’ll need more time than that to pass all the 4 sections, you probably might want to look at another course with unlimited access. Yaeger CPA review course is extensive, impressive and well explained in a very logical manner. It offers many benefits and all around value to their students than any other CPA review course. In fact, no other course comes close to their level of customer service because their live instructor hotline provides high-quality customer support and gives students direct access to instructors over the telephone. The innovations with the student portal will help you customize your study materials and focus on the important topics. You can easily create quizzes that test only subjects you struggle with, so you can make sure you feel confident about everything before sitting for your exam. Start your journey to success with Yaeger!